Syntel Company has decided to conduct the Syntel Off Campus 2018 Drive. So for that purpose, the officials had disclosed the notification for various job openings in the company. So the interested and eligible candidates can apply for the vacancies through below provided registration link. Syntel is a global company that offers the world of opportunities for the fresher candidates. Contenders who had completed their graduation or post graduation can apply for the vacancies. Before going to the application process the candidates have to check the details about the eligibility criteria, selection process, salary from this page. For the sake of the candidates, we have furnished a direct link to apply for the Syntel Off Campus. So candidates can use that link to complete the application process. Every year the Syntel organizes the off campus drive for the freshers. Syntel is going to conduct off campus drive this time for Fresher in various cities like Pune, Mumbai, Chennai, Gurgaon, Hyderabad, Bangalore, Noida etc. So candidates who are capable to work with the company can apply for the vacancies according to their interested area. After applying the aspirants have to prepare well for the online written exam. For that purpose, we have given Syntel Test Pattern and Syllabus in a detailed manner. Along with that, the aspirants can get Syntel Placement Papers and Syntel Interview Questions asked before at the time of interview rounds. BE/ B.Tech (Computer Science and Information Technology), MCA (Computer Applications). B.Sc. / BCA / BCS (Computer Science, Computer Application, Mathematics, Information Technology, Statistics). B.Com (Infomation Technology), Diploma (Computers, IT). M.Sc (Mathematics, Computer Science, Information Technology, Statistics). The aspirant who had 60% in SSC (X) and Intermediate (XII) with a good record. Graduation (UG) and Post Graduation (PG) candidates should have 60% aggregate in all the semesters and overall percentage. At the time applying the candidates should not have backlogs in Graduation or post graduation. Even if the candidate denied the conditions and applied those applications will be rejected and not allowed to attend for the Syntel Off Campus Drive. Flexible to work in any shift i.e; 24×7. Able to relocate the location. Must have knowledge in mathematics and should be good at calculations. After applying for the Syntel Off Campus Drive the candidates will receive a call from the company officials whether the aspirant can attend for the drive or not. In that, the details about the selection process/ Interview Process will include. Usually, the salary will vary from one position to another position. So the aspirants who performed well in the interview can acquire pay scale as per his/ her talent. For Freshers the Syntel is offering 3.3 lakhs package per annum. Latest 2 Passport size Photos. Original documents of SSC and Intermediate studies. All semesters original and photocopy mark sheets of graduation and post graduation. 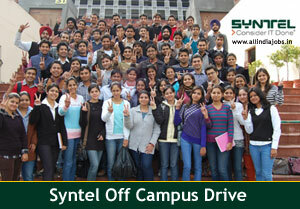 By following these steps candidates can easily apply for the Syntel Off-Campus Drive. Have a look at the form completely and be ready with all the particulars required. Read the instructions carefully and fill all the required details without any confusion. Now submit the form by cross-checking the details once. At this point, we are providing some tips for the aspirants who are going to attend for the Syntel off-campus 2018. Contenders can follow the steps to clear all the rounds in the selection process easier. Go through the Syntel Placement Papers. Use those papers a mock test and can improve your solving skills. Have a look at the core subjects of graduation and post graduation. Practice all the sections of each and every topic. As you are perfect with all the concepts in the written round so the candidates can go through the Syntel Interview Question. Hope the data about the Syntel Off Campus Drive 2018 are useful for the job hunting candidates. If any of the candidates is not matching the criteria given here they can go with other drive details from our website www.allindiajobs.in. Candidates who have any doubts with the information on this page can drop an email to us by using the email id provided in contact us page.